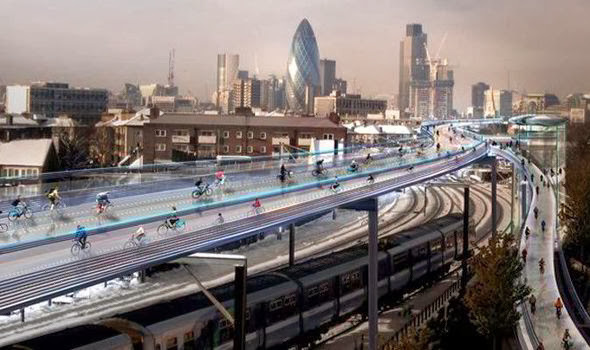 Read more about how London is becoming the Village Idiot of Urban Innovation with other ideas like this one. Now of course this isn't a good idea. This is classic Magpie Architecture. Attempting to attract people to big shiny things that dazzle but that have little functional value in the development of a city. Then again, Foster is a master of building big shiny things. Ideas like these are city killers. Removing great numbers of citizens who could be cycling down city streets past shops and cafés on their way to work or school and placing them on a shelf, far away from everything else. All this in a city that is so far behind in reestablishing cycling as transport that it's embarrassing. With most of the population already whining about bicycles on streets, sticking them up in the air, out of the way, is hardly going to help returning bicycles to the urban fabric of the city. With urban planning, now more than ever before, heading back to the future - back to when cities were life-sized places with rational and practical solutions for moving people around - ideas like these stand out like a sore thumb. "You say that as if Foster and the starchitect league have ever attempted to understand how streets work in general." Foster grew up on this street south of Manchester, back in an age when Manchester had around 20% modal share for bicycles. Instead of realising that modern urban planning is seeking to return our cities to their pre-car state, he insists on dishing up city-killing, Bladerunner fantasies. You would hope that Foster would seek back to his roots and embrace the kind of city he grew up in. £220 million pounds for the first 6 km stretch from Stratford to Liverpool Street? Seriously? For that price any urban planning firm could propose a world-beating transport plan for London, the city could pay to implement it and there would still be change leftover for schools, social programmes or whatever else. What an obscene amount of money to spend on Magpie Architecture. I've read that the estimated average speed would be 24 km/h up there in the Sky. The average speed for Citizen Cyclists in Copenhagen and Amsterdam is 15 km/h. That's the speed that a few hundred thousand people sub-consciously settle upon whilst cycling through a city. There are those who go faster, sure, but understanding basic bicycle anthopology should be at the forefront of our thinking. Bicycles belong at street level. Bicycle users are just pedestrians on wheels, not to be confused with motorised traffic. Creating safe, separated infrastructure on our streets is the way forward. Back to the future. Bicycles are the most effective and powerful tool we have for re-building our liveable cities. The Sky Cycle seems to focus on the 1%. The spandexian demographic. It will never get built, of that we can be certain, but if play Foster's fantasy game, there would be a few bicycle users using it. But nowhere near the numbers that have been predicted. The Sky Cycle idea also disregards another basic fact in city transport. Decades of experience in Denmark and the Netherlands has determined that the majority of bicycle users will cycle up to seven kilometres. The number of bicycle users drops dramatically in the 8-15 km zone. Indeed, under 10% of bicycle commuters entering the City of Copenhagen are coming from the 8-15 km zone. The Bicycle Superhighway project in Copenhagen, aimed at upgrading existing infrastructure in this zone in order to encourage more to cycle from this zone is a great idea, but they are only expecting an increase of about 10,000 cyclists when it's completed. A great number, to be sure, but unlike the Sky Cycle project that boasts of the 5.8 million Londoners living within 10 minutes of the Sky Cycle, they are realistic about numbers of potential bicycle users and their behaviour. Oh, and in doing so they will spend between £45 million and £96 million. Not for a 6 km stretch, but for 28 routes through 20 municipalities of a total of 500 km in length that will span the entire network spanning the entire Greater Copenhagen region. The Sky Cycle will be the greatest transport flop in history, simply because it fails to understand the importance of bicycle traffic in urban planning. Also because it's a stupid idea, but hey. It's not a new idea. Look at the drawing at the very top. Stuff like this has been around for awhile. Has it ever been built? No. Rationality ended up winning the day. The California Cycleway in Pasadena, built in 1900, was a similar idea, one that provided an A to B route from Pasadena to Los Angeles, but even it only lasted a couple of years and ended up being sold for lumber. The City of Calgary has had a pedestrian walkway system in their downtown core since 1970 called Plus 15. 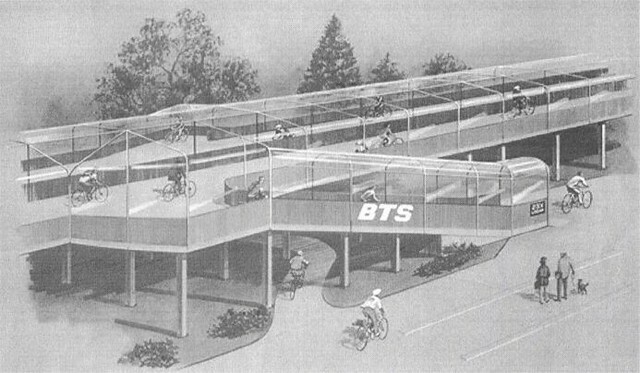 Another city-killing idea that strangles street life. I can recommend watching waydowntown, the urban planning mockumentary by Gary Burns, which is unflattering towards the Plus 15, to say the least. Funny how the rising stars of bicycle urbanism like Paris, New York, Chicago, Bordeaux, Barcelona, Dublin, Seville, etc etc, haven't bothered with lofty starchitect visions. They just rolled up their sleeves, dusted off their rationality and started tackling their urban problems with infrastructure and traffic calming measures. While Foster and too many others are obsessed with commuting instead of bicycle culture, others cities are on the fast track to going back to the future. Using far less money and getting far better results much quicker. Absolutely everything we need to reestablish the bicycle as transport and to modernise our cities into more liveable urban spaces has already been invented a century ago. Unlike so many others dazzled by the fact that this idea has been pushed forward by Norman Robert Foster, Lord Foster of Thames Bank, OM Kt, I refuse to be blinded. It's a ridiculous idea that shits all over the efforts of so many of my colleagues around the world who know better. Remember, this, Norm... you're only as good as your latest idea.